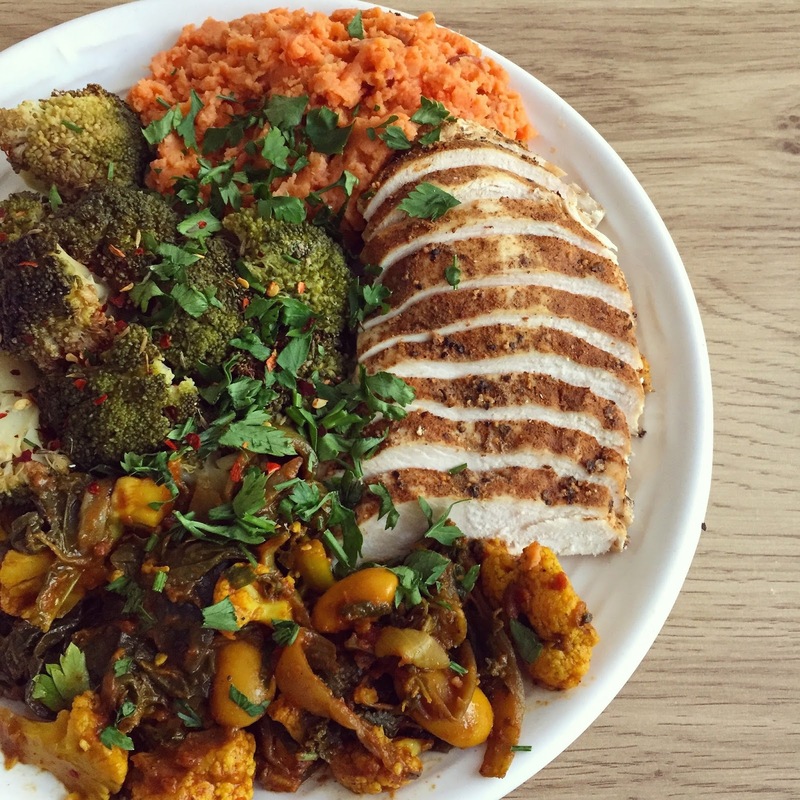 I came up with this recipe when I fancied doing something a little bit different with my weekly veg prep and now it's a firm favourite of mine. It's such an easy way of using any veg you have in the fridge as things can be subbed in and out as you wish. The use of bone broth instead of stock reduces the salt content and provides an extra nutrient boost. Bone broth is packed full of collagen, glycine and glutamine, to name a few, which can help heal the gut lining, promote healthy hair and skin as well as fight inflammation. Of course for any vegetarians or vegans out there you can sub the bone broth for vegetarian stock and then actually have this as a main dish on its own as it's so substantial. However, I often have the curry as a veggie side, as shown above, and then have it with chicken, salmon or sea bass. 1. Gently warm the spices in a large pan over a medium heat for a couple of minutes before adding the coconut oil and red onion. 2. Once the onion has softened, add the garlic, ginger and chilli and continue to cook for a couple more minutes. 3. Add the cauliflower, potatoes, bone broth, tomato purée, tomatoes and seasoning and bring to the boil before reducing to a simmer for about 20 minutes. You want the potato to be soft but not too soft that it's falling apart. 4. While this is simmering, add the cashews to a frying pan and gently toast until golden. Remove from the heat and set aside. 5. 5 minutes before the curry is done simmering, add the butter beans, spinach and chopped coriander stems. 6. Once finished, stir in the cashews, serve up and garnish with the chopped coriander leaves. As with all curries, they taste even better the next day - perfect for luncboxes!